The Nevada System of Higher Education just performed a magic trick. They made $18.5 million disappear into thin air, and no one is looking for it. 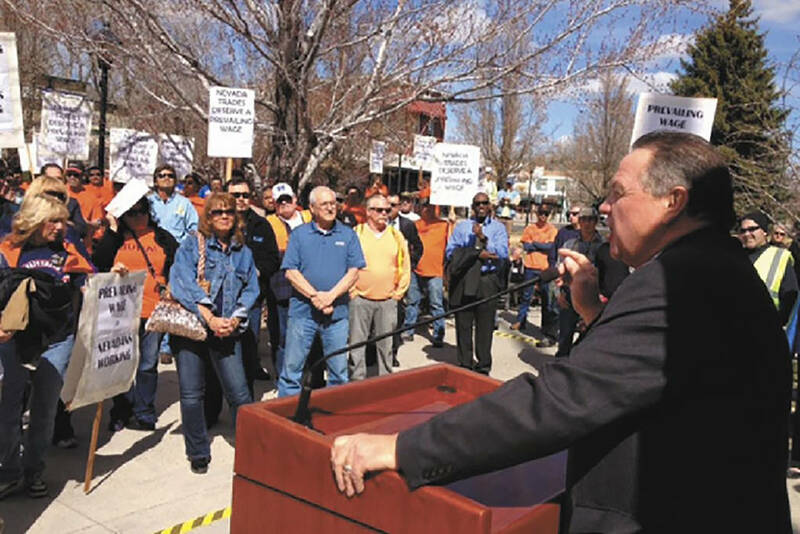 AFL-CIO leader Danny Thompson speaks to protesters who gathered Wednesday outside the Capitol in Carson City to protest changes proposed for Nevadas prevailing wage law. The Nevada System of Higher Education just performed a magic trick. It made $18.5 million disappear into thin air, and no one is looking for it. A top priority for Assembly Democrats is imposing prevailing wage requirements on school construction projects. Schools currently can pay 90 percent of the prevailing wage, but Assembly Bill 136 would make them pay the full amount. The bill would also require Nevada governments to pay prevailing wage on all construction projects that cost more than $100,000. The current floor is $250,000. The Nevada Policy Research Institute has found that prevailing wage rates in Nevada are 56 percent higher than market wage rates. As part of the legislative process, government agencies submit fiscal notes on bills. This tells lawmakers — and the public — how much proposals will cost state and local governments. This information is highly valuable. Something that’s a good idea at $5 million could be a very bad idea at $500 million. Democrats would rather pay off their union cronies than allow local governments to pay for additional education projects. That leads to the curious case of the Nevada System of Higher Education, which originally said the bill would cost it $18.5 million this biennium. But system officials withdrew their fiscal note in testimony before the Assembly Ways and Means Committee. The prevailing wage is politics at its worst. Politicians use the power of government to increase costs specifically to benefit politically connected unions. Those unions, in term, donate heavily to the same politicians. Disguising the true cost of this policy only makes it worse.